I enjoyed listening to your talk on Coast to Coast AM the other night. I was particularly interested in this topic of ghosts and your accurate description of them. My mother sold our childhood home after my dad’s death. It has passed through a couple of families that each stayed only a couple of years. Apparently my dad “haunts” the lower level, walking from the dining room to the bedroom. I am wondering why he’s there. He died in another state while on vacation and was really happy (and I think ready for death) at the time of his death. He’d spent the day trekking through Yellowstone, was feeling weak and died that night at the age of 88. Could it be his energy simply “imprinted” the area where he’d spent 40 years? That it’s not really anything to do with HIM in the house, just a remnant of repetitious energy? 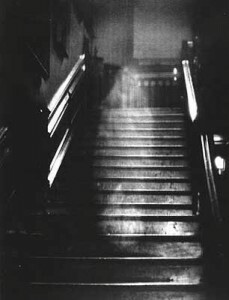 Recently my best friend saw the same type of apparition in her vacation home, of her mother walking down the hall. Her mother had never been to the house and they didn’t even own it while she was alive. She showed no sign of wanting to communicate, just passing through. I hate the thought that they’re stuck somewhere. My dad had such a beautiful death. He was left alone for about 30 minutes and simply died. The EMTs said he was smiling. Wonderful wonderful. I have a chapter on ghosts in The Last Frontier that might interest you and a set of blogs on ghosts on this site. Read them over and then contact me. If you or your friend see these apparitions again, try to make contact with them. In fact, don’t wait for an apparition. I think your father is in great shape and you could use some of his energy. Don’t worry about these walk throughs. Your friend’s mother was probably curious! Let me know what happens next. Am breathless to find out the next chapter! 1) Did I do the right thing? They never have scared me. I’ve experienced them all my life but usually keep it to myself. I was born without heartbeat and not breathing and have often wondered if during my ‘death’ I was somehow given the ability to experience them. Problem is that my wife doesn’t like them. They scare her. My step-daughter is less scared than my wife. Wife is afraid they are evil and has wondered if I risk my soul while dealing with them. We no longer talk about this, for her sake. My dad is a methodist minister. 78 years old now, so its been a long journey. He and my mother also know these things are real, and not always evil (which is rare for a methodist preacher!). My mother was saved by one while she was pregnant with me. He said to pray for protection whenever I experience them and to never speak to the spirits, just in case they are unfriendly ones. I guess I need to understand these issues. God gave this to me, and I cannot help but to think I should use it. Do you think God wants me to embrace this? Bible teachings don’t jive well with what I am able to interact with, and I sometimes wonder if they might – might – be demons in disguise. Sounds silly, I know. Even my father and my preacher don’t know what I should do. I mean, you just can’t walk up to even friends and tell them about this without being dismissed immediately (I then act like it was a joke to save face). Not sure if I asked my questions clearly enough for proper advice, but this has all weighed heavily on my since last July. Thank you for taking the time to read this. I do understand if you don’t have the time to answer them, but really, really, need your advice! Truthfully Keith, I have never really encountered “evil.” I don’t believe it exists outside of the human being’s capacity to create it. And I have never heard of an instance in which a person was harmed dealing with what are obviously thought forms or even the deceased. An easy way to control this is with music. Also be sure that you and your family members are not projecting repressed parts of themselves. Projections out of strongly repressed material can be very powerful. Hi. My dear friend just passed recently of a sudden diagnosis of terminal brain cancer. It has affected me deeply and I cannot get passed it. She had complained to me of not feeling well and headaches. I don’t feel I encouraged her strongly enough to seek medical attention. I feel as if I just want to say goodbye to her that I was left with this longing to do this. I want to thank her for everything she did for me and of course her friendship. I also have another close friend with stage IV cancer. I cannot bear to lose another friend. Is there any advice you can give me to express my feeling of gratitude and get some closure with my friend that has passed. What can I do to help my friend who is very ill be more comfortable when his time comes? When my friend passed it was late at night and I had no idea it was that particular night but I remember being in the state when you are almost asleep but still fairly alert. I saw what I thought was a pure white face. It flashed so fast that I could not make out whose face it was. Do you think it was my friend letting me know she passed? Do you believe we have guardians from the other side watching over us? I also have been studying Buddhism and they believe in reincarnation of the soul into other forms such as animals or as a person. That is until you reach a state of nirvana. Do you feel there is any validity in this? I have this feeling that I need to believe in something but another side of me feels that either way when the time comes as long as I have lived my life morally I will be ok. Your thoughts? Catherine, of course that face was your friend. That is exactly how it happens, and most often right at the time of a person’s passing too. Survival after death is real. Communication after death is real. And reincarnation is real, although I wouldn’t worry about the Buddhist interpretation. I do write about all of this extensively in my book, The Last Frontier. I’m sure it would help you and it will also help you to communicate with your friend who has just passed, and to cope with the illness of your other friend. If you want to write me personally, go to the Contact page and write me from there. I would be glad to answer any questions you have.